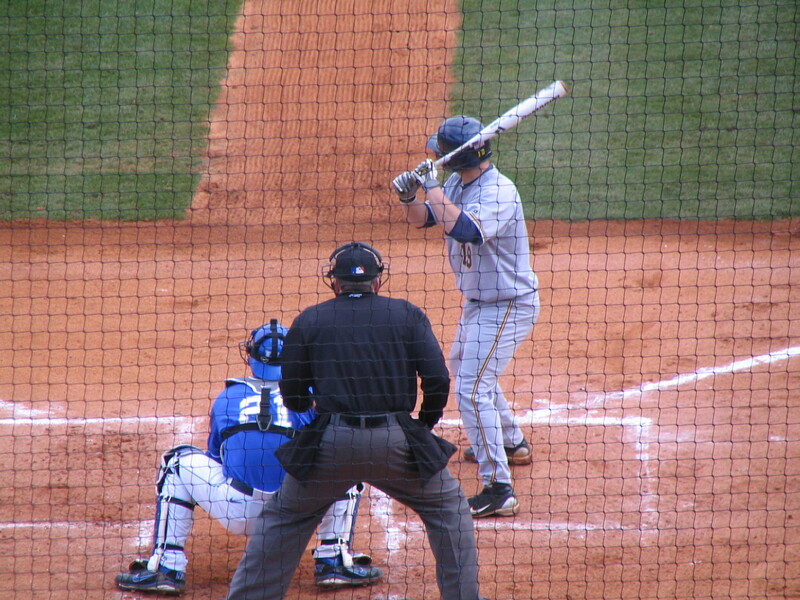 Murray State University‘s double-header versus Austin Peay was rained out. The two teams will play a double-header on Sunday. Morehead State University‘s double-header versus Southeast Missouri was rained out. The two teams will play a double-header on Sunday. A year ago this week University of Kentucky freshman J. T. Riddle was beginning his senior season at Western Hills High School, now he’s leading the Cats in batting while playing a new position. Riddle led the Cats to a series win in its first Southeastern Conference series of the season versus Tennessee this weekend with five hits, one home run and five RBI. On Friday and Sunday Riddle made diving catches in right field to save extra base hits. Through 20 games Riddle leads the Cats with a .381 batting average. On Sunday he slugged his first collegiate home run. Riddle’s hot start to his collegiate career has even surprised him. Riddle has driven in 10 runs this season, scored eight times and stolen four bases all while playing right field for the first time in his life. 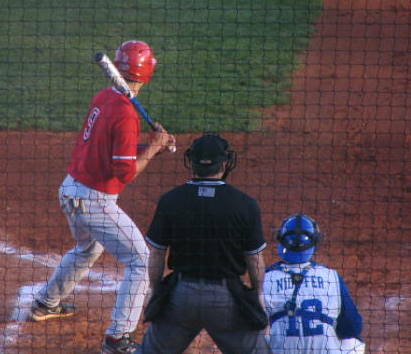 Riddle was named Mr. Kentucky baseball following his senior season at Western Hills and was drafted in the 35th round of the 2010 draft by the Boston Red Sox. When he arrived at UK he was expected to play shortstop and second base while occasionally pitching. What he wasn’t expected to do was become UK’s every day right fielder and play stellar defense. When UK lost its first two right fielders on the depth chart, redshirt senior Neiko Johnson and freshman Lucas Witt, to injury, Henderson turned to Riddle out of necessity. At UK’s preseason media day Henderson said Riddle was forcing his way into the lineup by hitting line drives throughout fall practice. Now 20 games into the season Riddle has not only hit his way into the lineup, he may be the team’s most valuable player. 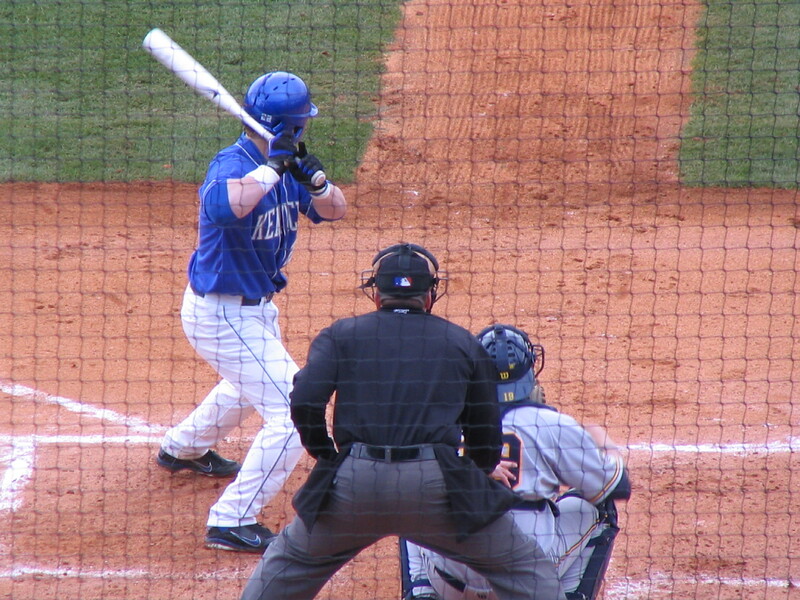 The University of Kentucky rallied from an early 5-0 deficit to post a 7-6 win over Murray State University. The Cats tied the game with two outs in the sixth inning on a two-run single from freshman right fielder J. T. Riddle and then took the lead on a RBI single from freshman designated hitter Dallen Reber. UK sophomore right-handed pitcher Walter Wijas earned the win after striking out two batters in a scoreless inning. Senior left-handed pitcher Mike Kaczmarek earned his third save of the season after coming on to pitch in the ninth inning with one out and two men on base and inducing a double-play to end the game. Riddle, Reber, sophomore center fielder Brian Adams and sophomore catcher Luke Maile each tallied two hits in the game for UK. Riddle entered the game as a defensive replacement for freshman outfielder Lucas Witt, who left with an apparent leg injury. University of Kentucky freshman outfielder Lucas Witt pulled a hip flexor during the Cats’ loss to UIC Friday, UK confirmed to BluGrass Baseball following the game. Witt will be re-evaluated today when the Cats hope to figure out a timetable for his return. Western Kentucky University catcher Matt Rice has been named a candidate for the Lowe’s Senior Class Award. Richard Durrett of ESPNDallas.com reports the Texas Rangers plan for Ashland native and former UK right-handed pitcher Brandon Webb to throw of a mound for the first time on Sunday. Bruce Levine of ESPNChicago.com talks with Louisville native and former Bellarmine right-handed pitcher Todd Wellemeyer, who says he realizes he is a long-shot to make the Cubs’ roster but hopes his previous experience in pitching well during Spring Training to make a team will pay off. C. Ray Hall of the Courier-Journal profiles the multiple aces of University of Louisville‘s starting rotation. Mark Sheldon of MLB.com profiles Louisville Bats outfielder Dave Sappelt and his fast ascension through the minor leagues. In our first two weekend review posts there was little wrong with UofL’s or WKU’s opening weekend performance. That trend stops now as each of the other four Kentucky teams combined to go 0-12 on the weekend. In the third post we will look at the University of Kentucky. Freshmen struggle: UK head coach Gary Henderson is always quick to downplay the expectations for freshmen playing in the Southeastern Conference, but even he had to admit the Cats would need contributions from youngsters this season. It was probably too much to ask for freshmen to carry UK during their first collegiate series, but the Cats had to hope for a little more than they got this weekend. At the plate three freshmen hitters, J. T. Riddle, Matt Reida and Lucas Witt, combined to go 1-13 with seven strikeouts. On the mound two freshmen relievers, Corey Littrell and Trevor Gott, combined to go 0-2 after surrendering nine runs in four and one-third innings. On the bright side, four of those nine runs were unearned. Defense comes up short for Cats: At preseason media day Henderson said the Cats’ season would depend on pitching and defense, but after the first series of the year he can’t be happy with the Cats’ defensive effort. On Saturday Marshall scored four unearned runs in the eighth inning to break open what was a 2-2 tie after a throwing error by second baseman Neiko Johnson. On Sunday Miami (Ohio) scored the go-ahead run after junior catcher Michael Williams dropped what would have been an outfield assist gunning down the go-ahead run at home plate. On the weekend UK recorded four errors, but two of them came at crucial times. The defensive lapses on Saturday and Sunday wasted two superb starts from Alex Meyer and Taylor Rogers. Meyer and Rogers combined for 20 strikeouts in 13 innings. Revolving door at second base: In three games Henderson started three different players at second base: freshmen Reida and Riddle and redshirt senior Johnson. The three batters combined to go 1-9 during their time at second base. At media day Henderson said he would focus on the best defensive option at the position, so he couldn’t have been happy that both Reida and Johnson committed errors while at second base. The problems at second base could have been overlooked if UK had found any offense elsewhere. The Cats batted .181 on the weekend. The University of Kentucky couldn’t silence the powerful College of Charleston offense in an 11-6, season-opening loss to the No. 20 Cougars. UK jumped out to a 3-1 lead on a three-run home run from junior first baseman Braden Kapteyn in the top of the third inning, but College of Charleston answered with four runs in the bottom of the inning to retake the lead. UK tied the game again in the sixth inning with two runs, but the Cougars put the game out of reach with five runs in the bottom of the sixth. Paul Laurence Dunbar alum Casey Lucchese pitched a scoreless ninth inning to close out the game for College of Charleston. As part of BluGrass Baseball‘s ongoing college preview check out this team-by-team breakdown of 2011 Kentucky collegians who have been previously selected in the MLB draft. UofL freshman right-handed pitcher Dace Kime is the only player to have been drafted in the first 10 rounds of the draft, and UK freshman right-handed pitcher Jonathan Paquet is the only player to have been drafted multiple times. Players are listed with the school they were at when drafted, draft round and year. Over the past few weeks BluGrass Baseball has been counting down the top 2011 returning Kentucky collegians. Freshmen and junior-college transfers were excluded from that list, but don’t worry the newcomers are about to get their due. Check out the preseason all-newcomer team below. The team is focused on players who are projected to receive major playing time for their respective schools. Honorable mention: Murray St. junior-college transfer Jacob Rhodes figures to be a mainstay in the Breds’ lineup at either catcher or designated hitter. There is no clear first base candidate among the 2011 Kentucky newcomers, Beers may start for the Breds so he takes this spot almost by default. Beers batted .300 with five home runs and 25 RBI as a sophomore at Mineral Area College. Honorable mention: UK head coach Gary Henderson said freshman infielder J. T. Riddle could see time at first base if carries his strong spring offensive performance over to the season. Henderson hasn’t officially named a starter at second base for the Cats, but all signs point to Reida as the likely winner of that position battle. Reida may struggle with the bat early on, but as a plus defender he figures to get plenty of playing time at the position. Honorable mention: Murray St. junior-college transfer Travis Isaak batted .420 with eight home runs and 19 doubles as a sophomore at Lincoln Trail Community College. On Monday UofL head coach Dan McDonnell announced Chittenden would start at shortstop for the Cards. Chittenden batted .588 with eight home runs and 19 stolen bases as a senior in high school. Honorable mention: Morehead St. freshman infielder Bud Morton may not start for the Eagles to begin the season, but he adds an excitement factor to the lineup the Eagles could use. Honorable mention: EKU freshman infielder Bryan Soloman, who head coach Jason Stein called “a complete third baseman,” is projected to start for the Colonels. Baseball America recently ranked Hutchinson, who was an all-American at 2010 NJCAA World Series champion Iowa Western Community College, the No. 3 newcomer in the Sun Belt Conference. WKU head coach Chris Finwood expects Hutchinson to provide a middle-of-the-order power presence for the Hilltoppers this season. In an interview with College Baseball Daily, UK head coach Gary Henderson singled Witt out as a the freshmen outfielder who was making the best case to start in right field. Witt may not be the full-time starter to begin the season, but he figures to see plenty of playing time in 2010. Ritzheimer batted .405 with three home runs and 20 RBI as a freshman at Kaskaskia College in 2010, and he should push for playing time in the Murray State outfield this season. 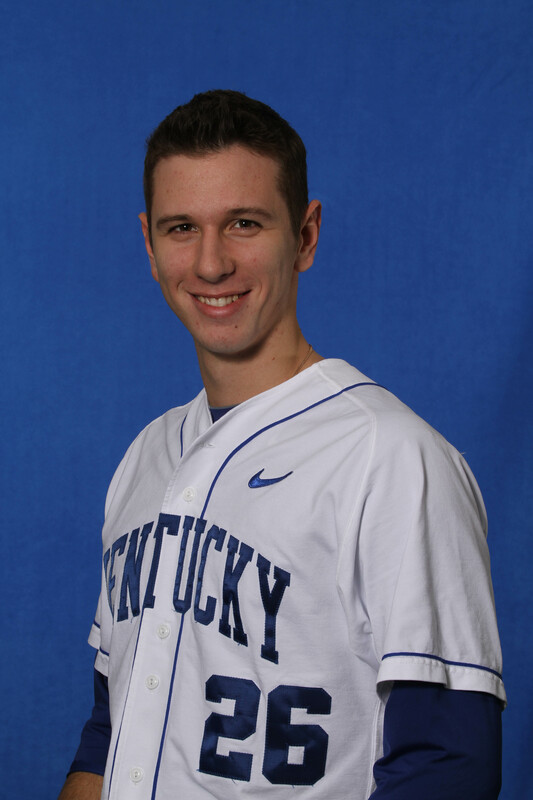 Honorable Mention — UK freshman infielder and outfielder Dallen Reber probably has the most power on the UK roster and will likely push for playing time in right field for the Cats. Junior-college trasnfer Ivan Hartle will start at second base for WKU this season and only is included at DH here to get him into the starting lineup. Hartle was named the NJCAA Division I defensive player of the year in 2010 while playing for the NJCAA World Series champion, Iowa Western Community College. Honorable mention — UofL freshmen infielder Adam Engel will start for the Cards at designated hitter to begin the season. 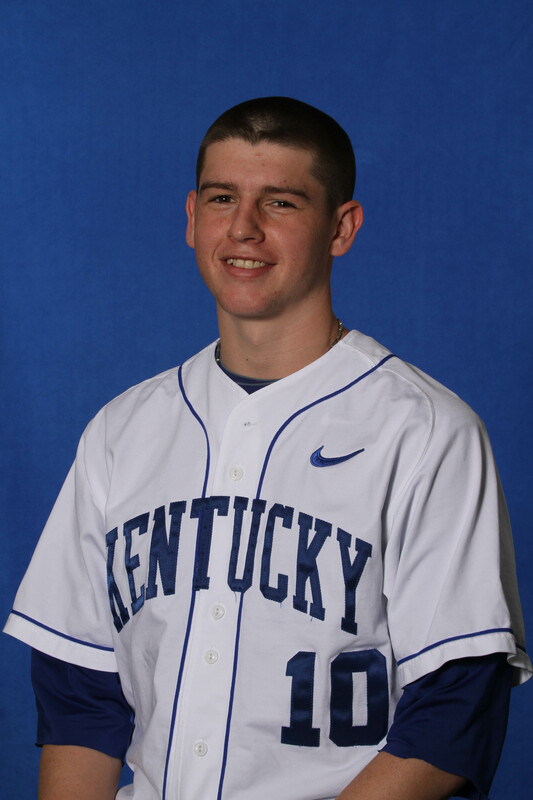 Freshman left-handed pitcher Corey Littrell will be UK’s primary midweek starting pitcher to begin the season and stands to be the first option on the weekend in the event of injury or poor performance by one of UK’s top three starters. 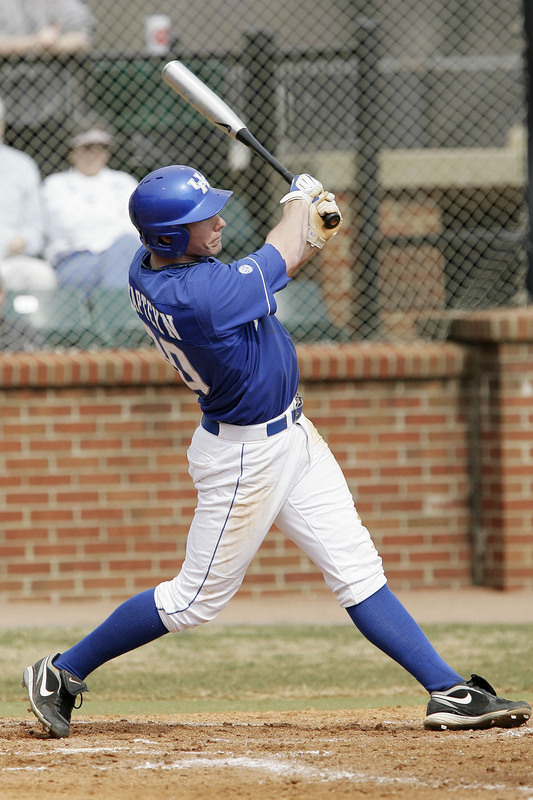 Littrell was all-state as a senior at Trinity High School and was the 43rd-round pick of the Nationals in 2010. WKU head coach Chris Finwood says freshman right-handed pitcher Justin Hageman, the 2010 32nd round pick of the Royals, has as much talent as any pitcher he saw on a Friday night during his time in the Southeastern Conference, but it remains to be seen what Hageman’s role will be with the Hilltoppers. He figures to begin the season as a midweek starting pitcher, but will move to the weekend rotation if he proves himself in that role. Freshman left-handed pitcher Kyle McGrath figures to begin the season as a midweek starting pitcher for the Colonels, but you have to figure he will be given every shot to carve out a more substantial role with the team considering the Colonels’ poor pitching performance in 2010. McGrath was all-state at Butler High School. Honorable mention — Due to the overall depth of UofL’s pitching staff, freshman right-handed pitcher Dace Kime may not start for the Cards this season but as the highest-drafted player attending a Kentucky college this season he figures to push for playing time in some role.